I will always love my art. It may not be the best, it may have its flaws and it may not appeal to the taste of everyone. There will be those who love it and others who simply do not like it. There are parts that may look off and anatomy that may look awkward. Colours may clash and designs may look bland. It may not receive as much attention as the other artworks. It certainly may not look as good as the art done by the professionals, But at the end of the day, it's the art produced by my own hands, my own hard work and constant efforts. And even if Im not completely satisfied with what i can do, i will always love my art. Because as long as I know i've done my best and am willing to improve, that's all that really matters. And this is what I constantly try and remind myself whenever I wanna punch my art in the face. Okay. I actually based this artwork on two things, first to lighten the negative feeling we often feel about our works, but mostly, it was based on happiness. Please always try to be optimistic even if things aren't going well! In my experience, being negative will only lead to no where. So yeah guys, love what you are able to do and stop putting yourselves down. Keep going, stay optimistic and never give up! It looks like she has a magical dress that leads to somewhere else. It does have a happy feeling about it. This is such a beautiful and happy picture. OMG. this is 1 of the best art I've seen. the burst of colors is amazing. I love how the colors r combined it just make my happy. This it's so cute and bright! It really uplifts one's mood when you see this : D.
This is truly one of your best works! uwah thank you! I'm glad you think so! ;//w//; It's so nice to see something so positive in my inbox! incredible blast of colour and happiness!! Your artworks always bring me happiness So colourful, so joyful, such a great feeling, thank you so so much!!!!! Wether u like ur work or not...But I absolutely love it! All i can say is "AWESOOOOOOMMEEEEEEEE!! " Raayzel, you are probably one of the more inspirational people here on DA to me. I'm glad I found you. ;A; You really know how to tug at my heartstrings and motivate me to work harder. This is my new favorite piece from you. 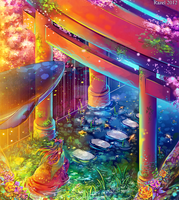 <333 Everything's so vibrant and magical. ;u; I can't stop looking at it. The details in this piece are gorgeous as usual !! PURI WHY YOU FOREVER KIND TO ME. I MUST HAVE DONE MANY GREAT DEEDS IN MY PAST LIFE. ITS ALLL FROM YOUR OWN KINDNESS BB * 7 *!!! Wow you have a lot to say! I agree with your statements. your right about the negativity thing you get no where tryign to explain this to people is very hard. anyway What brightness! i think my room is being lit up by the brightness of this pic alone haha! I just love the detail in this the bright colours it's all fantastic! well done to you! My only critiques would be the eyes i think maybe if it was a more of solid colour with a hint of other it would work better i find it too busy for my liking but other than that a really good picture! well done! I love this piece as much as I love your description. I'm afraid I'll run out of worthy words for your art soon. ;____; You always show us such a lovely, beautiful and pure world! !